I'm so excited to show my "Random Letters!" quilt today! This quilt was inspired by the Uppercase fabric line designed by Janine Vangool and printed by Windham Fabrics. All the letters, and some of the background, were pieced using the Uppercase fabrics. I designed the letters myself, using a 5x5 block grid for each letter. I limited the pieces in each letter block to squares and multiples of squares, half square triangles and quarter square triangles. No curves or applique were allowed! It was a challenge! Some letters were harder to design than others. I owe the letter "V" to a good friend who is a calligrapher/letterpress printer/typographer. She looked at my "V" and thought it could be better. We sat at her kitchen table, each with our graph paper, and tried again. She found a good solution before I did! Many thanks to E for the letter "V"! Note: There are patterns available for pieced letters. I'd never had any interest in piecing letters before and I didn't look at any of they available designs before I drew out my own. Except for the V, these are all my invention. It seemed appropriate to make this quilt with letter blocks because the Uppercase fabric designs were originally graphic designs used on the covers of Uppercase Magazine! (Click the link to seecovers from back issues of the magazine). Letters = printed text! I turned two of my letters on their side because letters in the "All Caps" pattern of the Uppercase fabric were turned. Turning the letters also adds a more modern look to the quilt! The above photo is the back of the quilt. It's fun to see all the beautiful colors of the Uppercase fabrics stacked up together in a column. (The floral and solids aren't part of the Uppercase line). My quilt design originally had 26 letter blocks and 4 blocks of negative space. With just 4 empty blocks, the negative space didn't balance well. So I added punctuation! It's quilted with straight line quilting, done with a walking foot. I used both pale grey and light blue green thread for the quilting. This is a quilt for young and old alike! 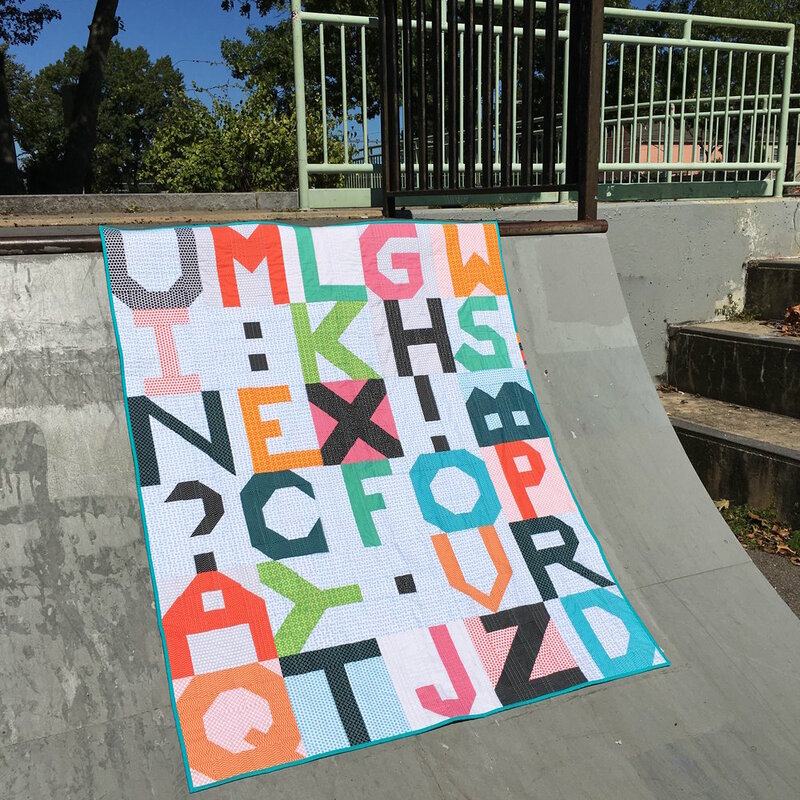 I took these photos at the local skateboard park just to emphasize the fact that this is "so not your typical ABC" nursery quilt! (Quote thanks to my teenage niece)! "Random Letters!" is definitely one of my all time favorite quilts! The "By the Bundle" book with a 'short stack' of "Uppercase" FQs by Windham Fabrics, purchased at Modern Textiles, Fargo, ND. Now the question was, what to make with this selection of tiny print fabrics? Emma Jean Jansen's new 2016 book By the Bundle has been getting great reviews on social media so I decided to get a copy for myself. Lucky Spool LLC has published yet another winning quilt book! I really enjoyed reading the book and looking at Emma Jean's quilts. Her photos were taken outdoors and have amazing Australian landscapes as backgrounds. There are several quilts I really like. "Star Burst", "Half Moons" and "Nellie Gray" are all quilts I would enjoy making myself. But it was "The Hi Quilt" which provided the inspiration a quilt using the Uppercase fabric. Emma Jean says "The Hi Quilt" was designed as a simple geometric pattern. It was her daughter who saw the letters H and I in the design! I thought about making "The Hi Quilt" pattern. It would look fabulous with the Uppercase fabrics. But then I decided it would be fun to design my own letters. Using squares and half square triangles, I drew out blocks for the entire alphabet. That was a challenge! Most are of the letter blocks look great, but a few are a bit odd! I think I am going to pick my favorites and not use the entire alphabet. This will be a random letter sampler quilt. Each letter block is unique so this quilt isn't going to be done any time soon. I can't wait to really get going on this project! Here is my first block. Letter R! *Historical aside: I went to college in Fargo-Moorhead--that's where I learned to quilt! Too bad Modern Textiles wasn't there when I was in college! This store has a lovely assortment of fabrics and shopping in their on-line store made me feel like I'd gone back to the Upper Midwest for a visit! There was even a hand-written note in the box when it arrived! Really nice!